Figure 8.9. Schematic illustration of a mirror MCF rocket. see also [Carpenter and Brennan, 1999]. Figure 8.4 shows that the exhaust velocity (i.e., the Isp) can be in the 105-106 m/s range, much larger than with nuclear thermal or nuclear electric propulsion and with a much simpler conceptual layout. In fact, a fusion mirror thruster is equivalent to a chemical rocket engine where combustion of propellants has been replaced by thermonuclear burning of D and T. In fact, this analogy is also conceivable for airbreathing propulsion and motivated a study of combined MHD airbreathing and fusion propulsion (see [Froning et al, 2005; Murthy and Froning, 1991]). This simile should not suggest that the problems posed by interstellar or QI travel and examined in Sections 8.1 to 8.5 can be quickly solved by fusion propulsion. Thrust still depends on thrust power, the product IspF. The much larger Isp possible with fusion rockets implies that, depending on spacecraft mass, reasonable acceleration to shorten long voyages needs large F and, accordingly, very large power. For instance, a thrust of order 50 tons with Isp of order 106 m/s needs a 500-GW reactor. Such power is not outlandish, but the volumetric energy density in MCF reactors so far tested (tokamak and other types of fusion machines) is low, and suggests that high-Isp, high-thrust MCF rockets must be voluminous and presumably also massive. Nevertheless, because of its inherent simplicity, thermal fusion propulsion is appealing to most propulsion experts, who think it is the better mode of propulsion. 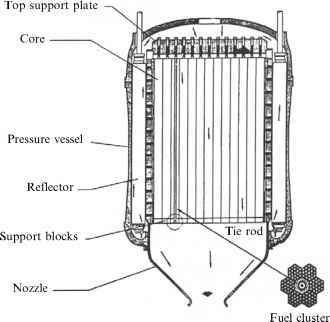 The most natural way of conceiving a thermal fusion propulsion system is that just described, where the propellant fuses and is exhausted in a continuous manner. This operation mode is sometimes called open magnetic confinement (OMC), and a technical analysis of its theory, issues, and work in progress is the subject of Appendix B at the end of this book.